What Science Fiction or Fantasy Show Should Come With a Warning Label? Sometimes when you're trying to get your friends into a show for the first time, you have to pass along some wisdom. Like, which episodes to skip, or what stuff is worth sitting through. But which TV show do you wish you could add a warning label to, for everybody who watches it for the first time? Buffy: Power through the first season to get to the good stuff! 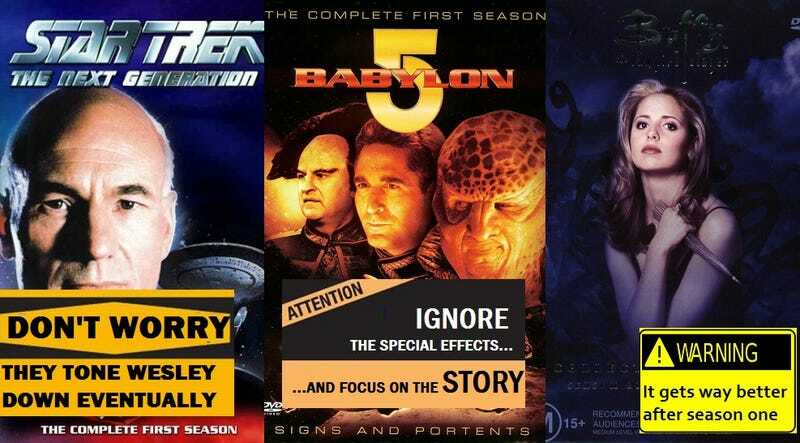 Babylon 5: Ignore the special effects and focus on the story! Star Trek: TNG: Don't worry, they tone down Wesley. Which warnings do you give people when you lend out a DVD set? Please include a picture or clip of the show in question, plus the title of the show. Thanks!